The occasional night out is a chance to rejuvenate your energy and catch up on your social life. It is a necessary part of maintaining balance and fending off stress. For each Spring, TX resident, a night out can mean something different: a trip to the casino, lavish dinner, bar hopping, dancing, etc. MK Limo provides luxury private transportation services to help ensure your night is carefree, fun, and safe. When you book with us, you can enjoy yourself with confidence knowing that you and your guests have access to reliable and convenient transportation for the evening. Luxuriate in the finest high end vehicle as you head out for a good time in Spring, Texas or nearby Houston. MK Limo offers the perfect complement to any special celebration. Whether it is a birthday, bachelor party, New Year's Eve, or other notable occasion, book with us to bring flair, style, and luxury to your night out. 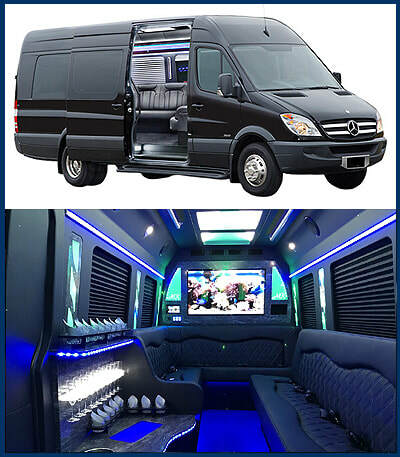 Our limousines and party buses are a great transportation solution for groups of all sizes. We ensure all guests have a safe and comfortable way to travel between destinations for the evening, while providing them an array of amenities to enjoy while on the road. Assume the glitz and glamour of super stardom for your night out with MK Limo. We provide you with a gorgeous, eye-catching luxury vehicle, VIP treatment, personalized service, and a full suite of onboard entertainment and amenities. Keep the party going all night long when you use our Spring, TX private transportation service. We attend to the driving so that our passengers can relax and enjoy themselves no matter what the night has in store. When you want the world to know that you have arrived, there is no better transportation service than MK Limo. We ensure your approach will not go unnoticed with our sleek and stylish luxury vehicles. Tinted windows preserve an air of mystery and suspense, providing you with privacy until you are ready to make your grand entrance. Our passengers receive the full celebrity treatment with front door drop offs and pick ups at their convenience. Make your Spring, TX night out an exercise in luxury and indulgence when you choose our highly rated limousine transportation service. When it comes to flexibility, convenience, and comfort, our Spring, TX limousine service cannot be beat. MK Limo caters to your schedule, ensuring that transportation is available whenever it is required during the course of your night out on the town. There is no need for long waits, cold walks, or frustrating searches when the evening comes to an end. Let us be your designated driver to ensure that you and your guests all arrive home safely after a night of fun and libations. Our professional and reliable limo service will attend to you and assist you for a positive, enjoyable experience that is sure to be remembered.